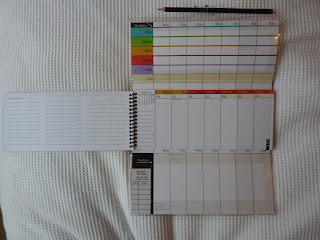 Here is my haul from Filofax, Dodo Pad and Success Choice! 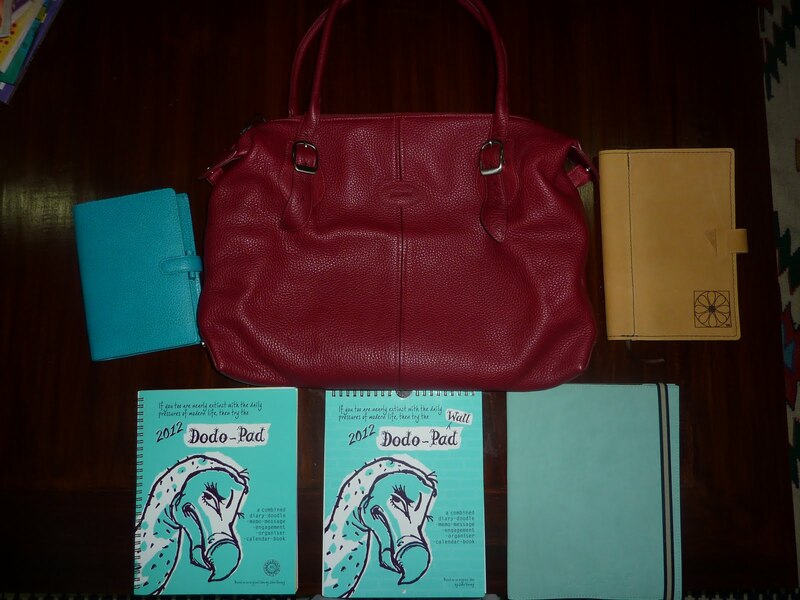 In the photo you see (clockwise from top center) the red Finchley tote by Filofax, which I've been wanting for ages; the buttery yellow brushed leather cover for my Woman's Success Planner from Success Choice; the Dodo Pad Nubuck cover in Aqua (which is so scrummy soft I can't get over it), 2012 Dodo Wall Pad and Dodo Pad diary with the handsome new style cover; and my new personal Aqua Finsbury Filofax! First thing you might notice is, none of these are colors I usually go for! I don't normally get anything red, but the dark Finchley red is just gorgeous. Also I'm into cheery colors these days like the yellow cover, and I'm definitely on an Aqua kick! I'm also on a leather kick in general, and all of these leather items are fabulous! Over the next couple of weeks I'll post more photos of each of these items on the following blogs: Finchley tote on Bagsey blog; Aqua Filofax on Philofaxy blog, and the Dodo Pad diaries, Nubuck cover, and Success Choice leather cover here on Plannerisms complete with interior photos. As a parting shot, look how gorgeous my personal Finsburies look together! Edited to add: my post about the Finchley tote is now up on Bagsey blog, and my post showing interior photos of my Aqua Finsbury is up on Philofaxy! I'm so excited about this calendar! Let me be the first to tell you: you NEED one of these. Those of you who have read my other posts about WeekDate products know I love the "Only Write It Once" format that allows you to see daily happenings along with weekly and monthly recurring items without having to rewrite anything, ever. 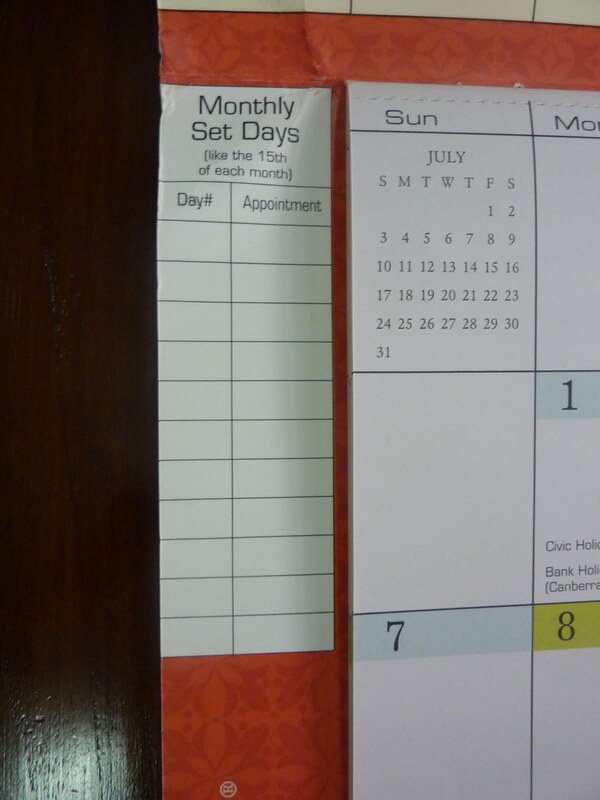 This calendar takes planning one step further by allowing the whole family (or alternatively, everyone in the office) to see the entire month at a view, including monthly and weekly recurring items all at once so nothing is ever forgotten, overlooked or double-booked. 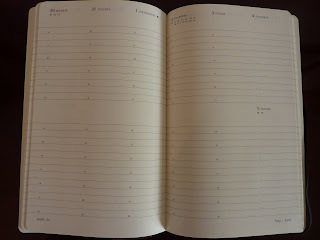 Below is the entire calendar open with the monthly recurring section at the top, current month in the middle, and weekly recurring section at the bottom. Click on any of the photos for a larger view. 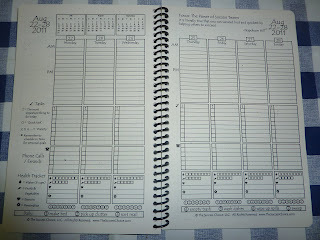 In the middle is the main section with the current month. 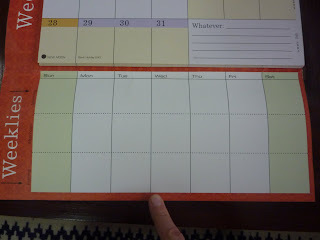 Notice that holidays and moon phases are printed on the day spaces. Each day's square is a generous 1 1/2 by 1 7/8 inches (my measurements). There's also a lined space for Whatever: notes, reminders, etc. There are also reference calendars at the top of the page for last month and next month. By looking at the color for the current day then glancing up at the corresponding day at the top, you can easily see if there are any monthly recurring events today. 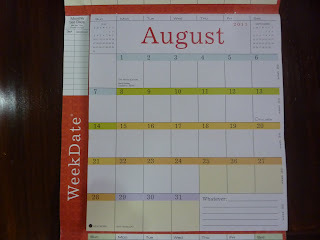 The bottom section of the calendar is the Weekly recurring section where you write your kids' sports and after-school activities, your weekly staff meeting every Tuesday morning, your weekly exercise schedule, rotating dinner menus, and anything else that happens every week or every other week. 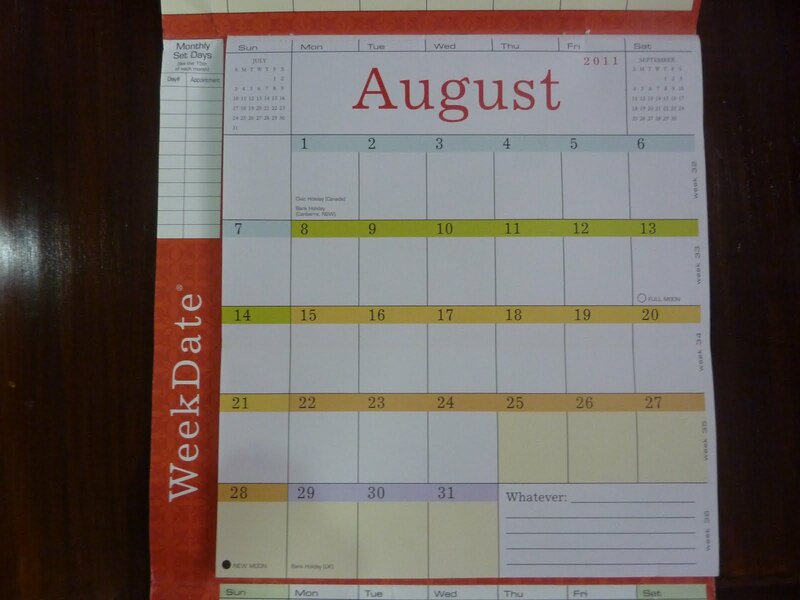 The weeks in the monthly calendar are numbered so you can note "Garbage pickup even weeks, Recycling odd weeks," for example, and know which to put out today without writing "Garbage" or "Recycling" every week in your calendar. Each day you look down to the corresponding column in the Weekly Recurring section to see what's on for the day. So for each day you look up the column to the corresponding color-coded day for monthly, and down the column for weekly recurring events to see everything that happens each day, without rewriting anything ever! 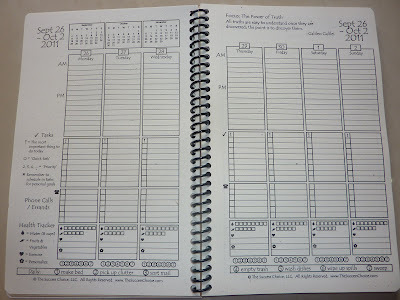 To the left of the monthly calendar is a place to write monthly set days like paydays and bills due, so that these are always visible. The calendar comes with a magnetic strip along the top and another magnet in the middle of the back, so the calendar can go straight up onto your fridge (where mine lives). It also has a plastic tab with a hole to hang on a nail or thumbtack on your wall or corkboard. 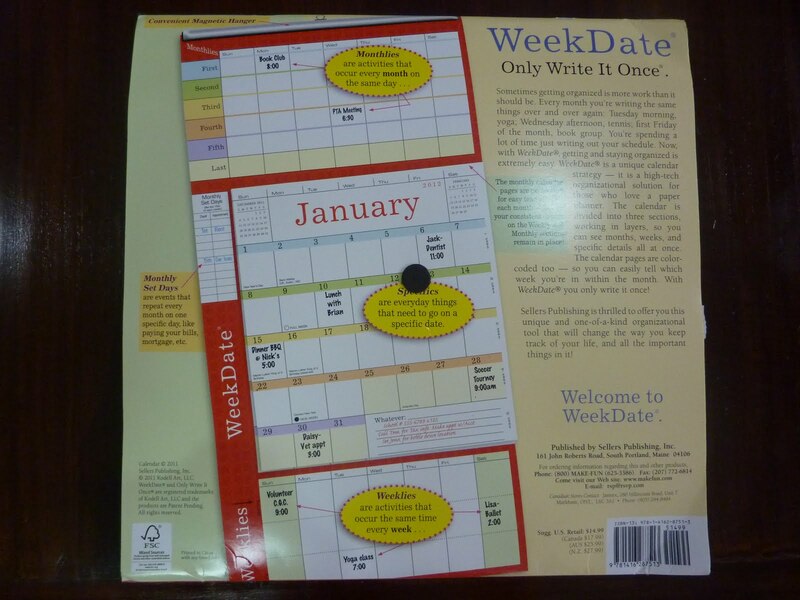 I originally pre-ordered my WeekDate Wall planner from Amazon, but weeks later it was still listed as Pre-Order while it was already shipping from Barnes and Noble. I was very impatient to get it so I canceled my pre-order from Amazon and ordered this calendar from Barnes and Noble. Sorry Amazon! 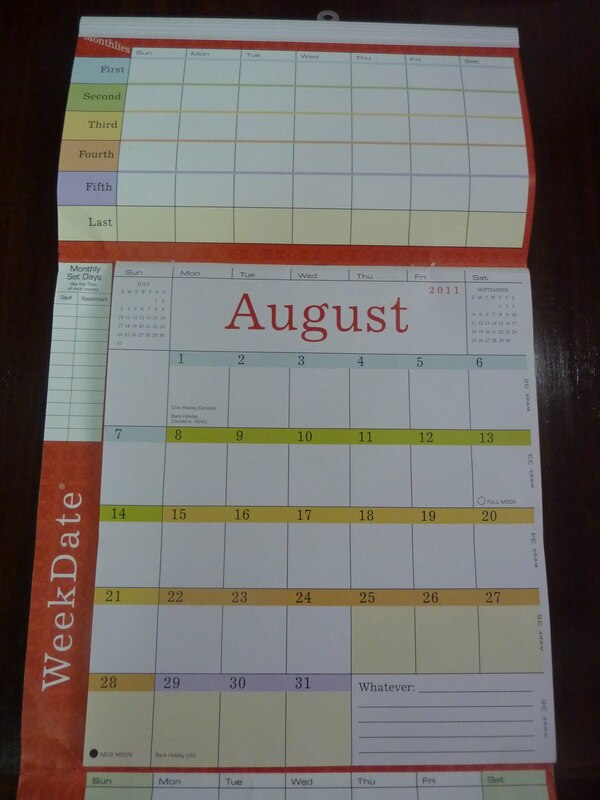 Click here for the WeekDate Wall planner page to see purchasing options. 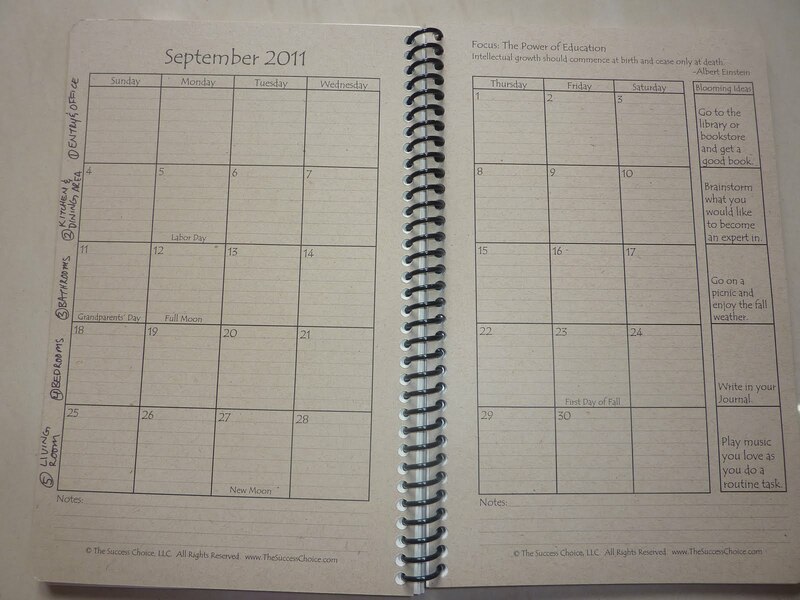 This planner goes from August 2011 all the way through December 2012, so it has you covered for the entire school year and upcoming calendar year too. And I still can't get over the price, less than 15 bucks! It's more than worth it. 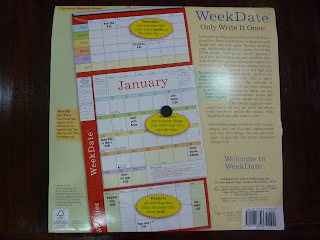 You can see all of WeekDate's products at www.WeekDate.com, including this monthly wall calendar, the weekly planner (which I have reviewed here on Plannerisms), their undated dry-erase WeekDate White (which I have reviewed here) and other products. 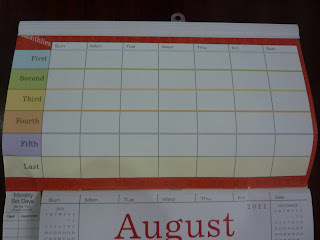 I am really looking forward to using this calendar to keep me organized and to simplify my life all year long! I love not having to re-write recurring events over and over on my calendar. I write recurring items in pencil, then if something changes I erase it, just once (without having to erase pages and pages of re-written entries). Congratulations to WeekDate on another extremely helpful product. Well done! 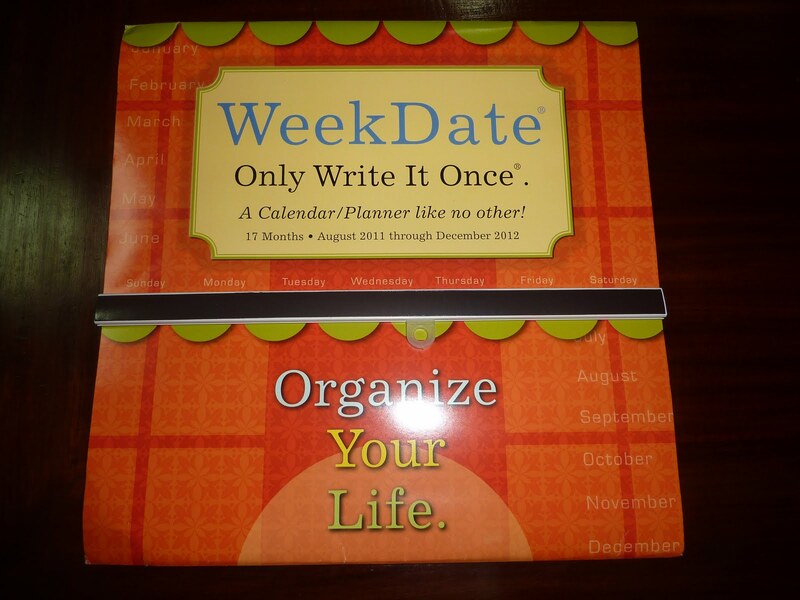 Be sure to follow WeekDate on Twitter for time-management tips, and follow them on Facebook too. Reader request: planner with day per page, weekly and monthly? 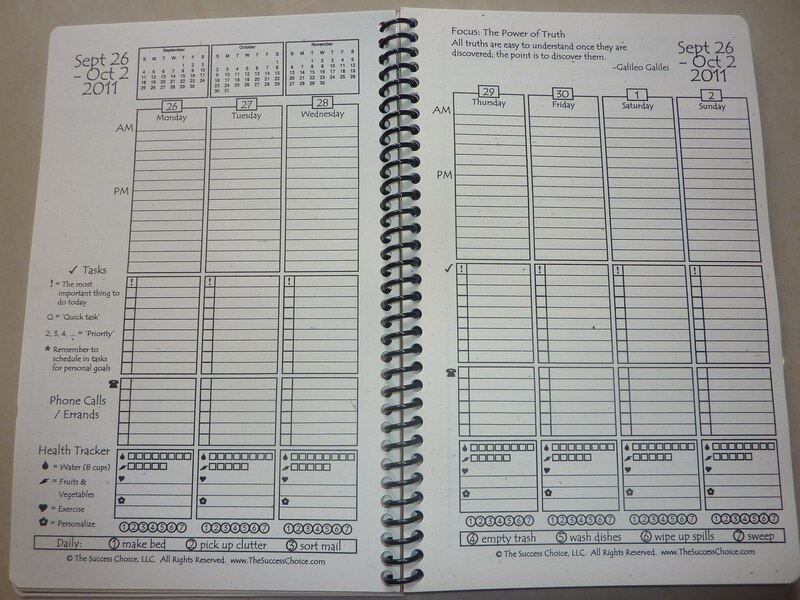 A reader emailed me recently asking if I know of a planner that has day per page, weekly views and month on two pages calendars all in one book. 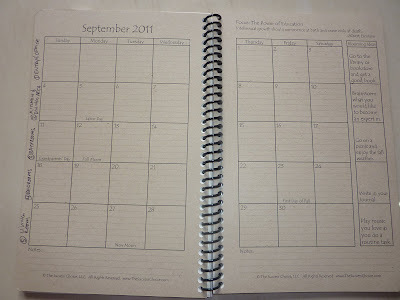 Does anyone know if a planner like this exists? I told the reader that the only way I know of having all three formats in one planner is to use a Filofax or Franklin Covey binder and put the inserts in, but I think she would rather have a bound book. 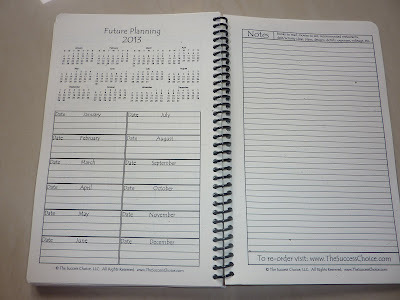 Please post a comment if you know of a planner with all three formats in one book. Thanks! 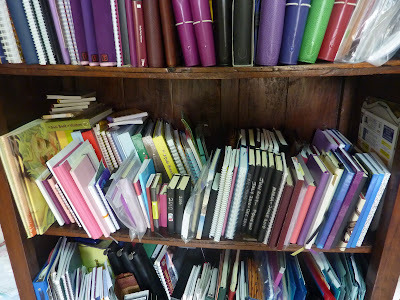 I've had several requests lately to show all the planners and notebooks I've reviewed here on Plannerisms "in a pile." My friends, that would be one heck of a pile. And I wouldn't want to have to clean it all up afterward. 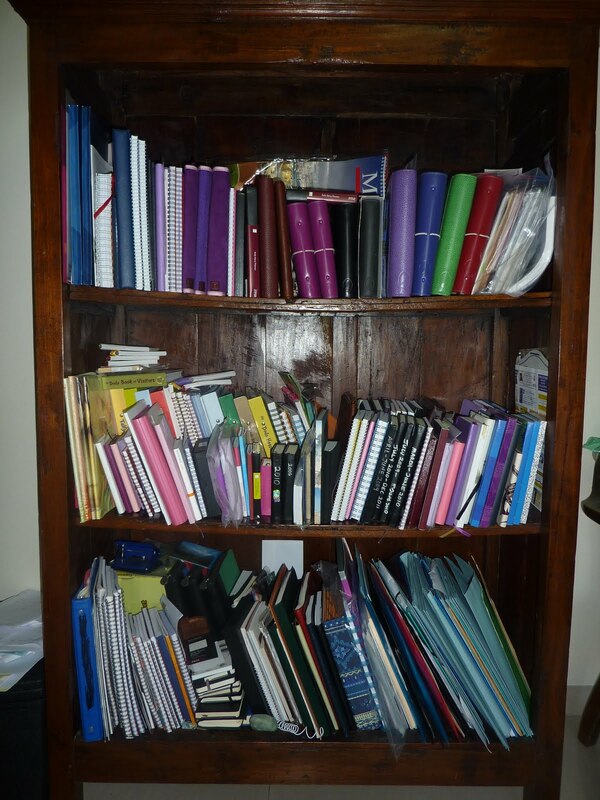 So instead, here is a photo of my bookcase that holds all my planners and notebooks, most of which have been reviewed on Plannerisms. Note that this bookcase is nearly 6 feet tall. Also notice most shelves are two rows deep. I'll show you each shelf so you can take it all in. Click on any of the photos for larger views. Deep breath. 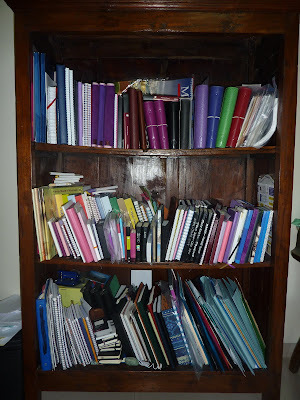 This shelf has most of my Filofaxes, my Rickshaw folios, Oberon cover, Renaissance Art cover, Uncalendars and other notebooks. 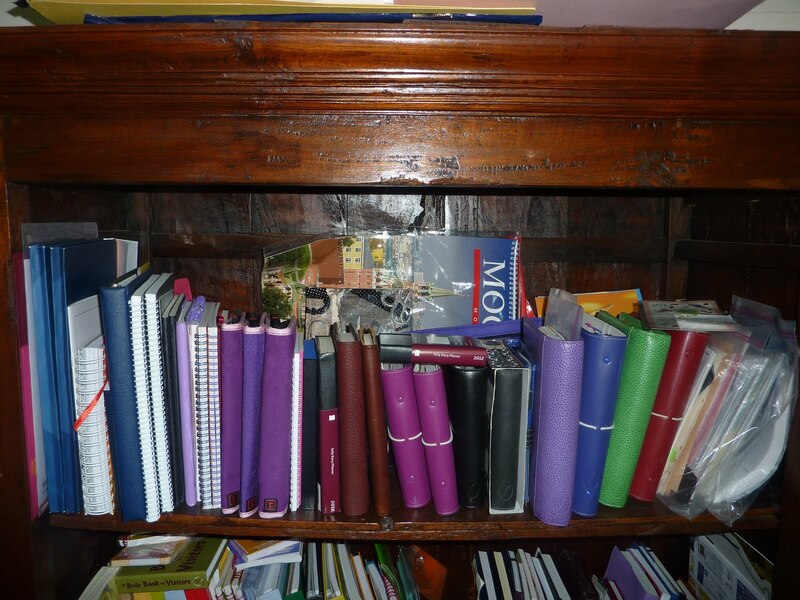 In the back are a few more books and a calendar of Moscow I bought when I lived there. 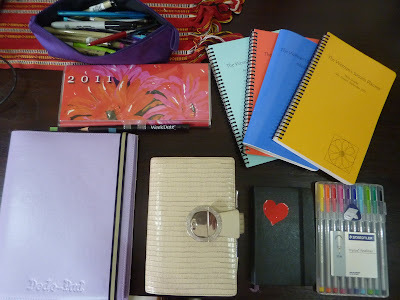 In the front you can see my new 2012 Moleskine Large and Pocket daily planners already on deck for next year. Yeah, this shelf is packed two rows deep. 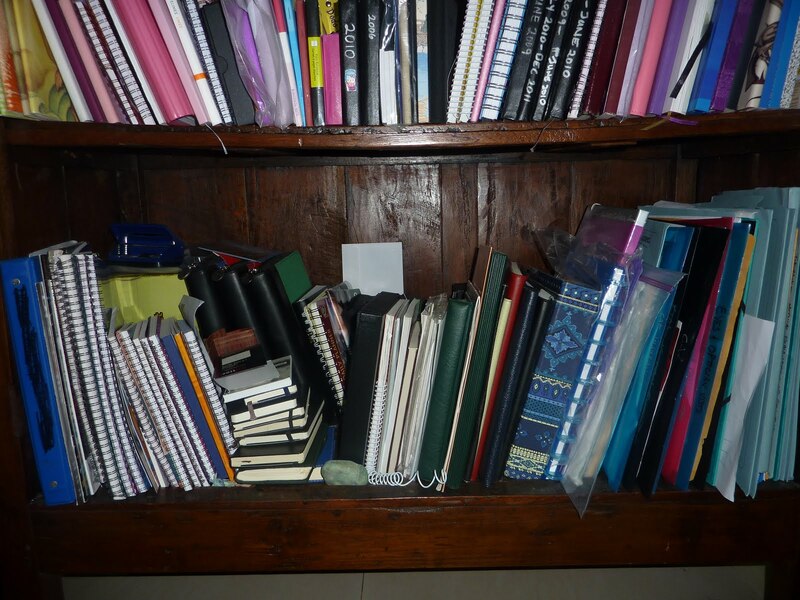 In the back are my Dodo Pad diaries and binders and a bunch of old planners. In the front are more old planners, notebooks used and new, and at the left are my brand new Moleskine cover art journals that I haven't decided what to use for yet. 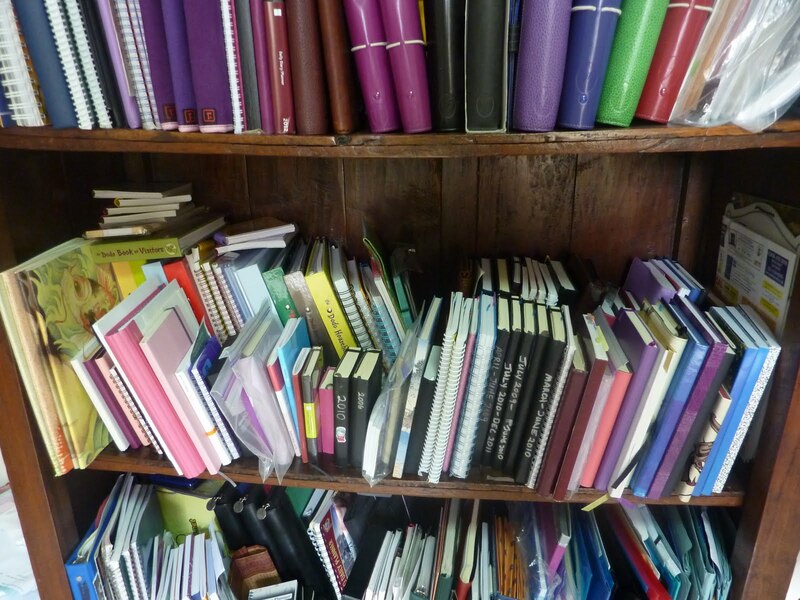 On this shelf you might be able to see my Plan-It planners, Daycraft notebooks, Clairefontaine hard cover notebooks, my Poppin and reecovid notebooks, Uncalendar Half Size planners and Organised Mum diary. 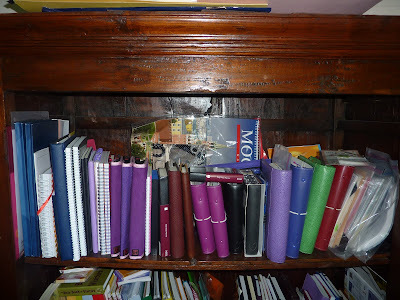 Bottom shelf has an ugly blue binder on the left, a bunch of Clairefontaine notebooks of various sizes, a pile of pocket notebooks and planners, a rock (I have random rocks lying around. I'm a geologist. ), the box containing my CNN planners and notebooks (such a nice box, such nice notebooks! 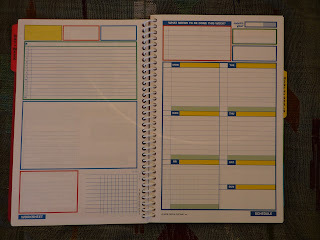 ), more Uncalendars, several Quo Vadis planners and other planners, a blue and white patterned accordion file I bought from UNICEF about 10 years ago, a Rollabind notebook, and files. Here are the planners that live on my desk, counterclockwise from left: my Extra Large Moleskine weekly notebook in my Dodo Pad cover, my gorgeous and beloved Deco Filofax, my pocket daily Moleskine logbook that I adore, my rainbow of Staedtler Fineliner pens, my Woman's Success Planners that are whipping my life into shape, and my awesome WeekDate planner that holds all my recurring events. 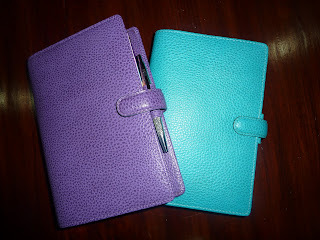 Above my WeekDate planner is my purple silk pen case. Not shown are the books I keep in my bag all the time, which are my purple personal Finsbury which is my Medical Filofax and my Moleskine Info book in its Renaissance Art cover. Also keep in mind that when my in-laws come at the end of this month they'll be bringing my leather cover for my Woman's Success Planner (I got the yellow one, my sis has one and says it's gorgeous and soooo soft), my new personal Aqua Finsbury Filofax (which I'm especially glad now that I ordered because they seem to be extinct! ), my 2012 Dodo Pad desk diary, Wall Pad and Aqua Nubuck cover (could not resist!!). 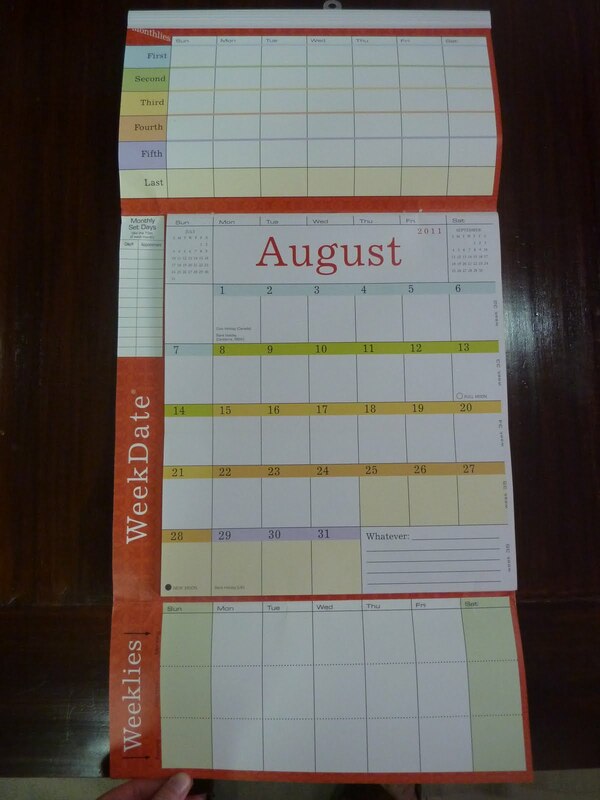 And, arriving soon in the mail is my hotly-anticipated WeekDate Wall calendar too. 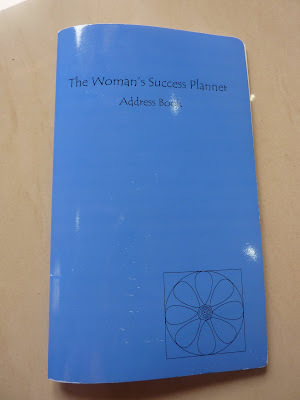 As promised, here is my review of The Woman's Success Address Book. 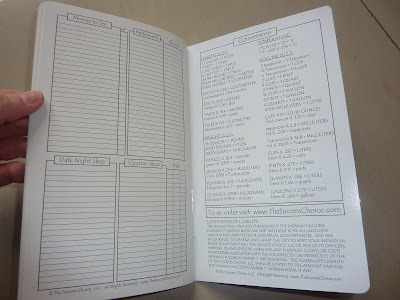 Many thanks to The Success Choice for generously sending me this address book as a sample to review! 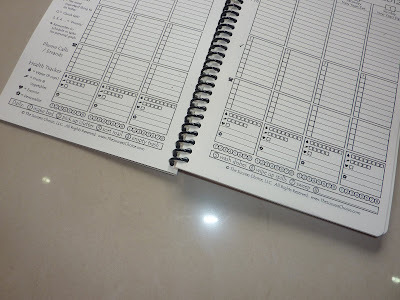 As you may have guessed from my post about the corresponding Woman's Success Planner (which is way more than just a planner), this is way more than just an address book! 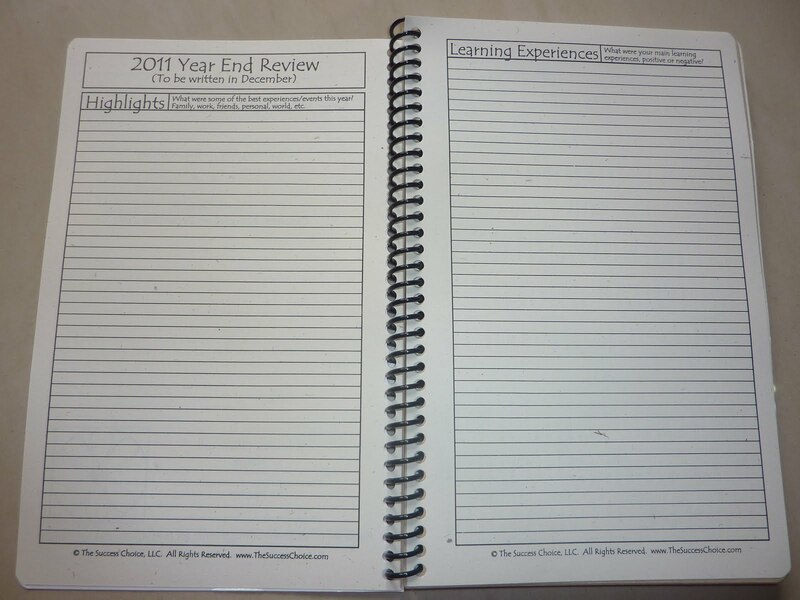 It is a reference and log that is super-slim and portable enough to take everywhere. You can use this to accompany any planner, or on its own. I'll walk you through the book. 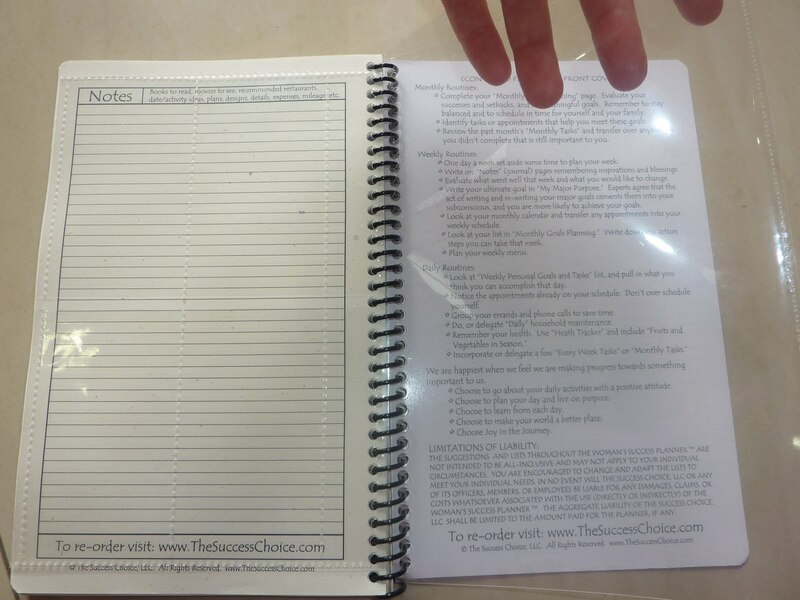 You can also see images of the pages on The Success Choice website's Address Book product page. The cover is laminated cardstock for durability. 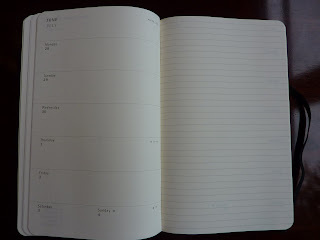 The paper in the Address Book is the same spectacular archival recycled paper as is in The Woman's Success Planners. It takes liquid inks especially well, and there is no show-through to the other side of the paper so you can fill each page with information. 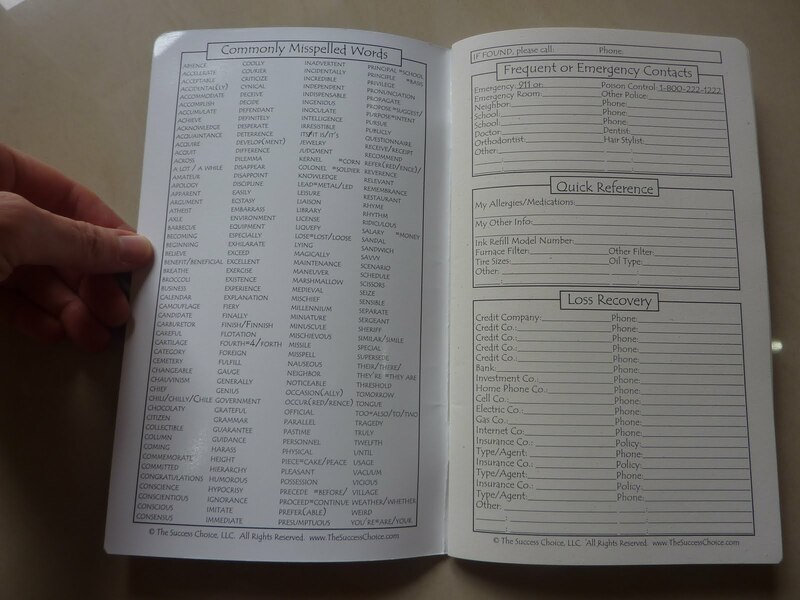 Inside the front cover there is a very handy list of Commonly Misspelled Words. 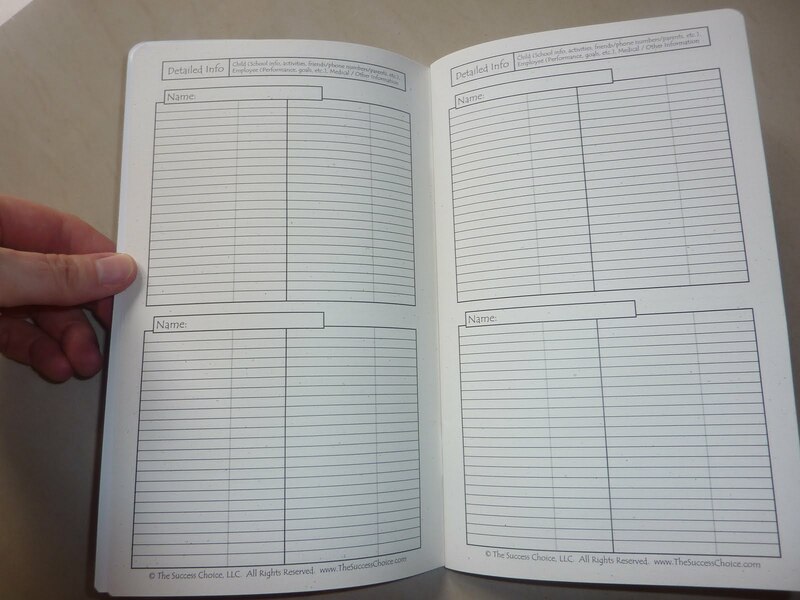 The back cover of the book states that the Address Book is specifically designed NOT to ask for information that could lead to identity theft. 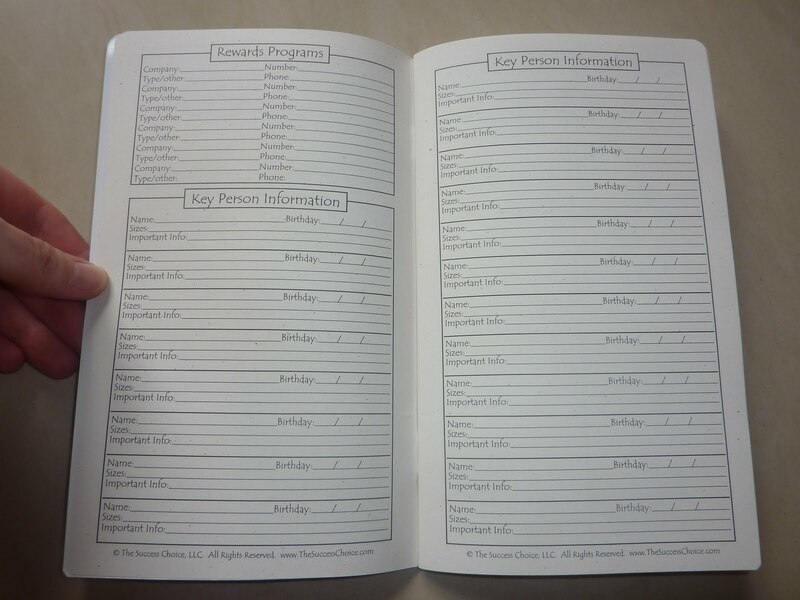 The next page has space to record Rewards Programs numbers, and Key Personal Information like sizes and birthdates. The next four pages have Detailed Info for individual members of your family. This could be school information, employee records, medical info like checkups and vaccines, etc. 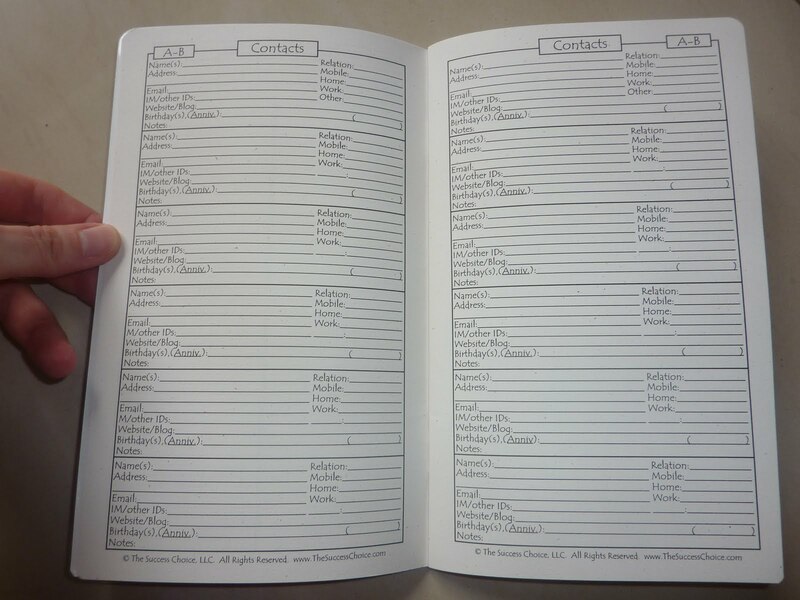 Next is the A-Z contacts section. 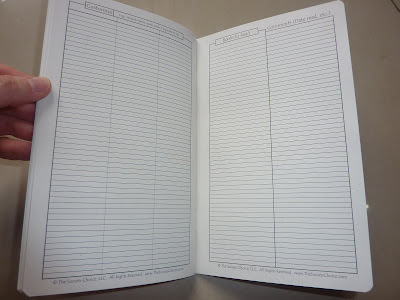 The pages have spaces to record each contact's name, relation (which I think is a wonderful addition), address, phone numbers of all types, email, IM ID, website or blog, birthday and anniversary, and notes on that person. After the A-Z section there is a page for annual reminders for recurring things like birthdays and anniversaries, insurance payments due, annual medical checks and anything else that happens in the same month every year. Next are two pages of Gift Ideas with space to write the person's name, list gift ideas and record the date the gift was given. 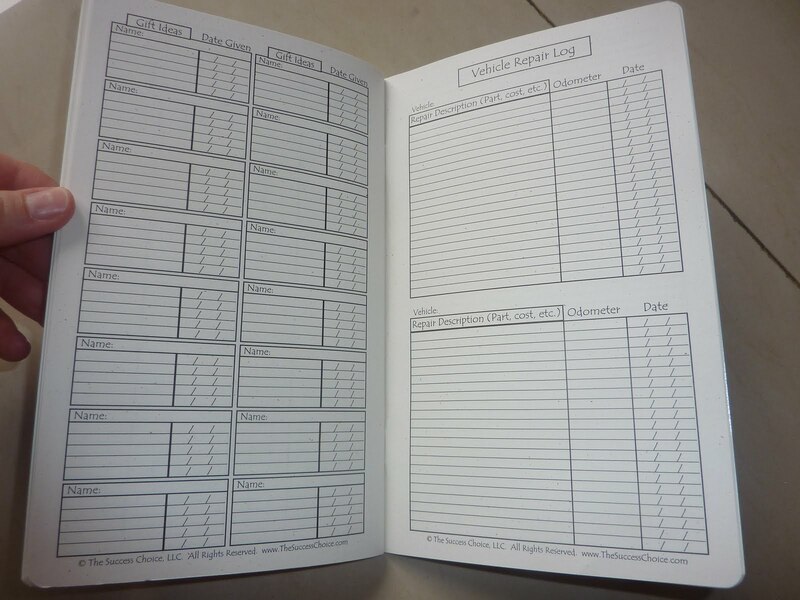 Next is a Vehicle Repair Log to record maintenance and repair on two vehicles with space to record the work done, cost, odometer reading at the time of repair, and the date the work was done. Next are three pages you can customize to suit your own needs. There is a page of Books to Read with a space to note comments. The last page has list areas for Movies to See, Restaurants with space for their phone numbers, Date Night Ideas and Vacation Ideas. Inside the back cover there is a Conversions table (which you know I love). This Address Book/ reference/ records book packs a ton of information into a very slim and portable book. It is 8 1/2 by 5 inches, and just 1/8 of an inch thick so it can go absolutely everywhere with you for easy reference and recording. So much thought has gone into this book, all the way down to the cover color which looks great with all the colors of the planners. It is designed to slip into the leather covers along with your planner, or used on its own. You can buy the Woman's Success Address Book on the Woman's Success Planners website, click here to see the product page. **Edited to add: Success Choice now does overseas shipping! Click here to contact them for more details. 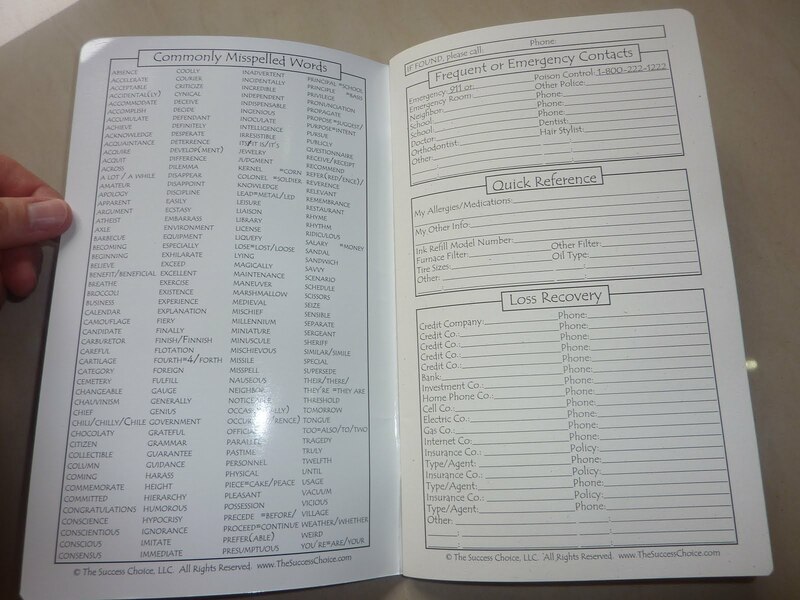 Thanks again to The Success Choice for sending me this excellent address book/ reference log! Okay everybody, hang onto yourselves. This is a big one!! 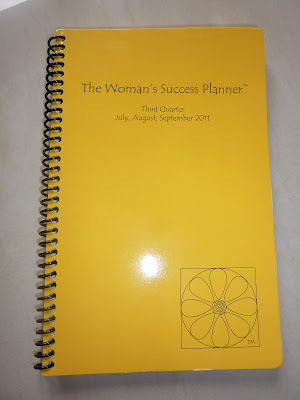 I first discovered the Woman's Success Planner when Amy commented about it in my Interesting Planners I've Never Tried post. I couldn't resist buying the entire year's worth of planners. Thank you Amy for pointing this planner out to me!! It. Is. Amazing!!!! 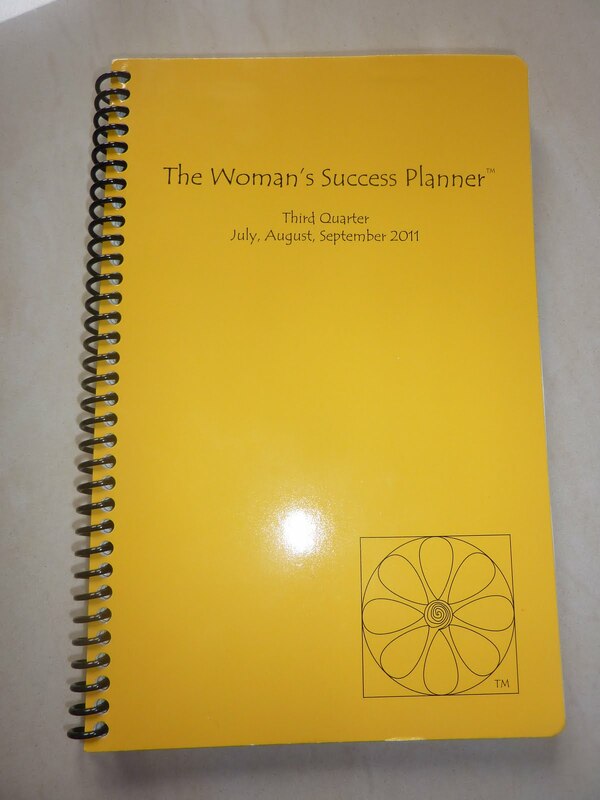 First of all, you need to go look at Rori's review of the Woman's Success Planner Third Quarter, then take a look at her follow-up post on how she's using it. When you're done, come back. My friends, you know I've seen a lot of planners. I can easily say this is the most comprehensive planner I've ever seen. 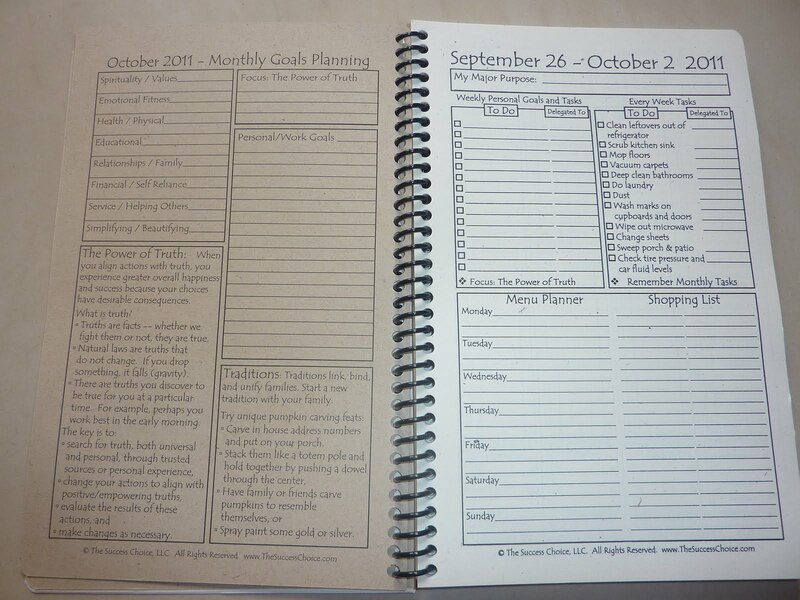 It incorporates planning, goal setting, journaling, household routines, personal growth and more all set into the planner's structure. 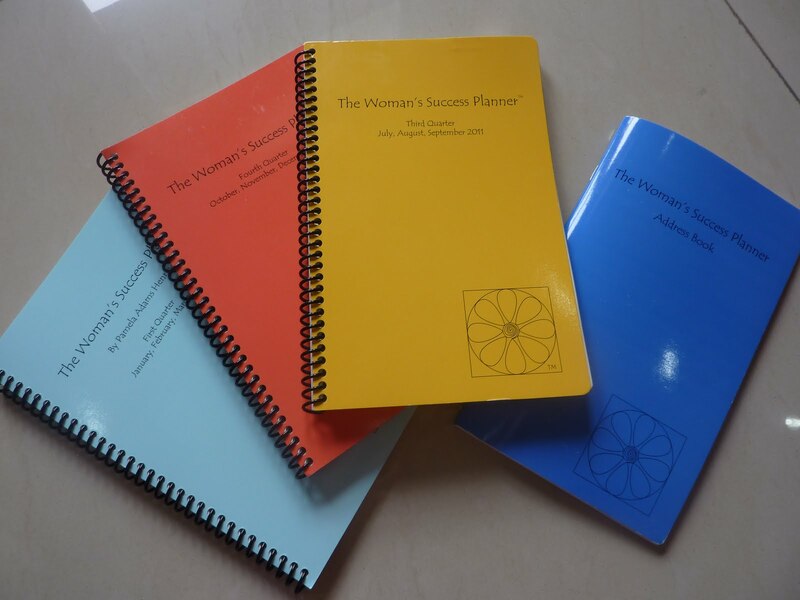 I spoke with Pamela Adams Henrie, the creator of the Woman's Success Planner, and she said she does a ton of reading and research to produce these planners. Let me explain. 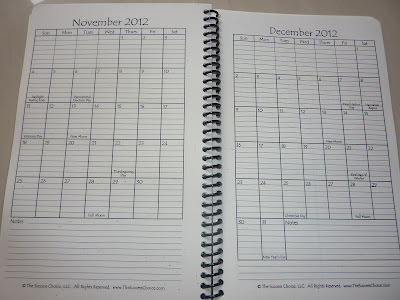 Each planner holds one quarter of the year. I started with the current quarter, July August and September, but you can jump in any time. I'll pretend we are starting at the beginning of the year and walk you through. 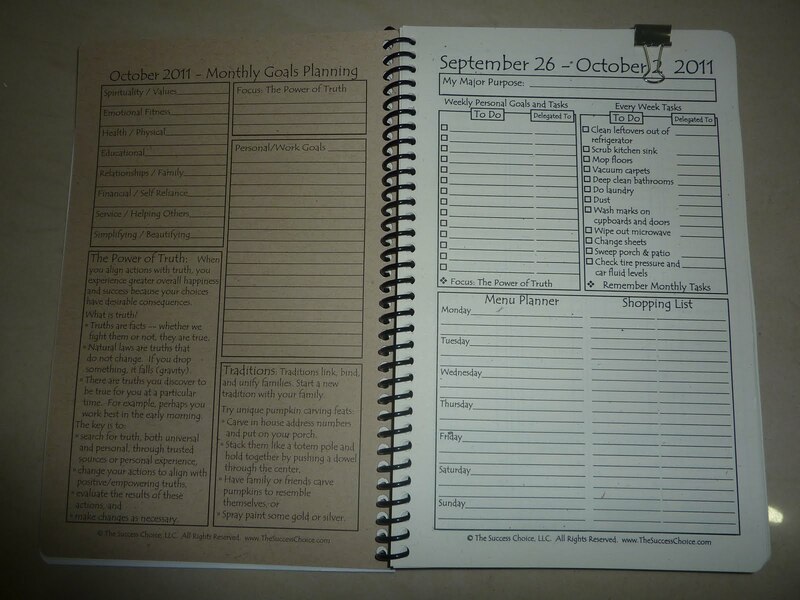 After the beginning goal setting pages come the monthly and weekly planners. The months are embedded in the weeks and incorporate monthly goal setting, household tasks, and monthly tips to motivate you. 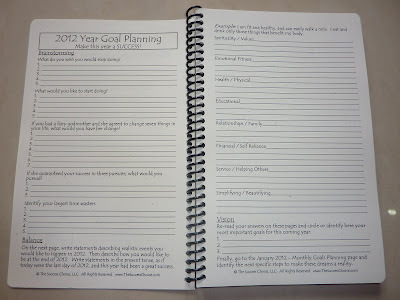 When you turn the page, next is the Monthly Goals page that helps you break down your goals to focus on all month. 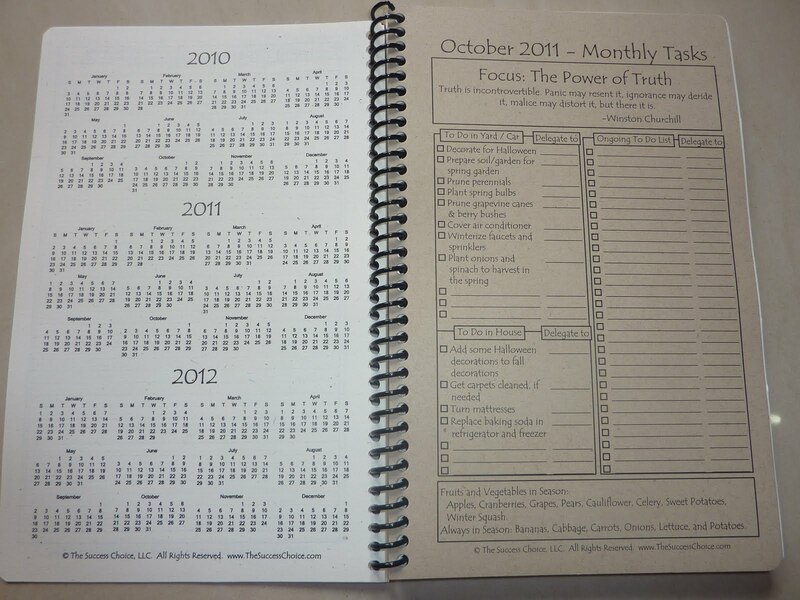 You can see the top left section is a breakdown of goals by theme; below that is text discussing The Power of Truth, October's monthly Focus. Top right is a space for you to make notes on your focus on The Power of Truth. Below that is space for your personal or work goals. And at the bottom right are suggestions for Traditions which I absolutely love. Especially now that I have kids I realize how important traditions are. 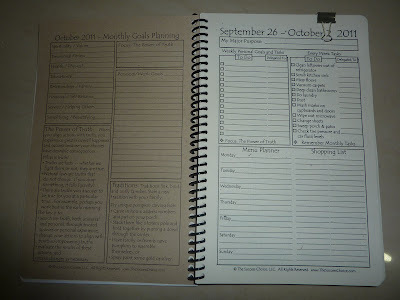 The right page is weekly goal-setting with topics of Weekly Personal Goals and Tasks, Every Week Tasks (household cleaning and maintenance) and below is a meal planning worksheet for the week including a shopping list. I use the meal planning area like crazy because usually my husband is the chef, but he just doesn't have time anymore with his new job so it's up to me to feed us. I use this space not only for meal planning but also notes on what my picky daughter liked and didn't (no onions in the meatloaf next time!) and any special ingredients this week (as in, what was on sale) that I can incorporate into meals. 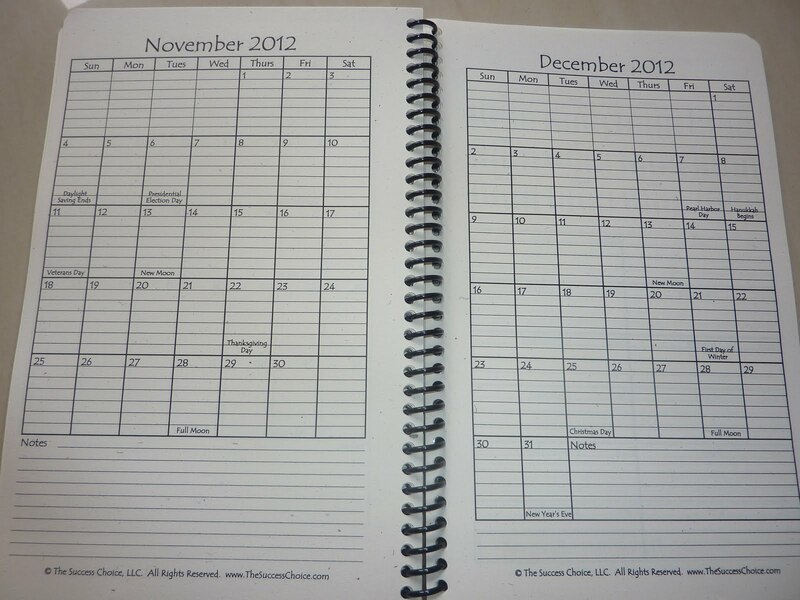 Then you turn the page and it's your weekly schedule spread. Click on the photo to enlarge because there's a lot going on with these pages. At the top of the pages are reference calendars for last-this-next month, and a motivational quote on the monthly theme. 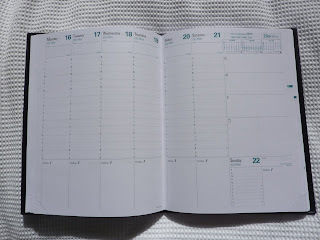 The weekly spread has all seven days as full-size columns, which I love. This particular week didn't have any holidays, but holidays are printed on the day spaces. The tops of the columns are organized for your appointments AM and PM. Below that is a section for your tasks with prioritization tips. 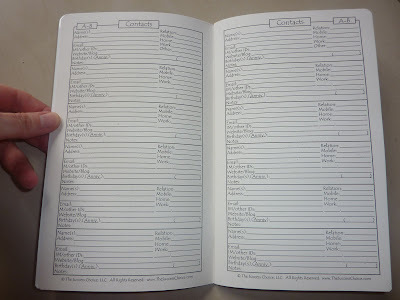 Below that is a section to help you consolidate phone calls or errands. I love that household chores are written in a checklist so you know what needs to be done each week. 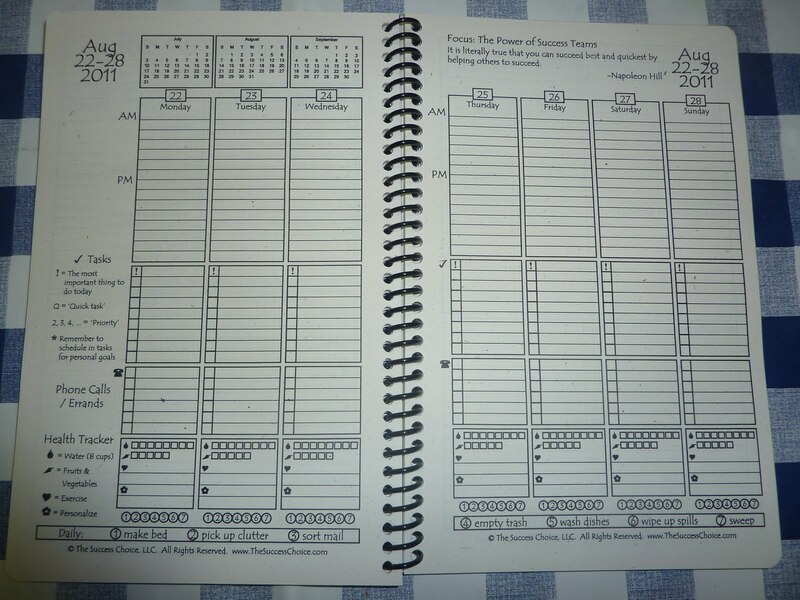 The monthly pages hold your monthly and seasonal chores, the weekly pages list your weekly chores and the weekly schedule has your daily chores. 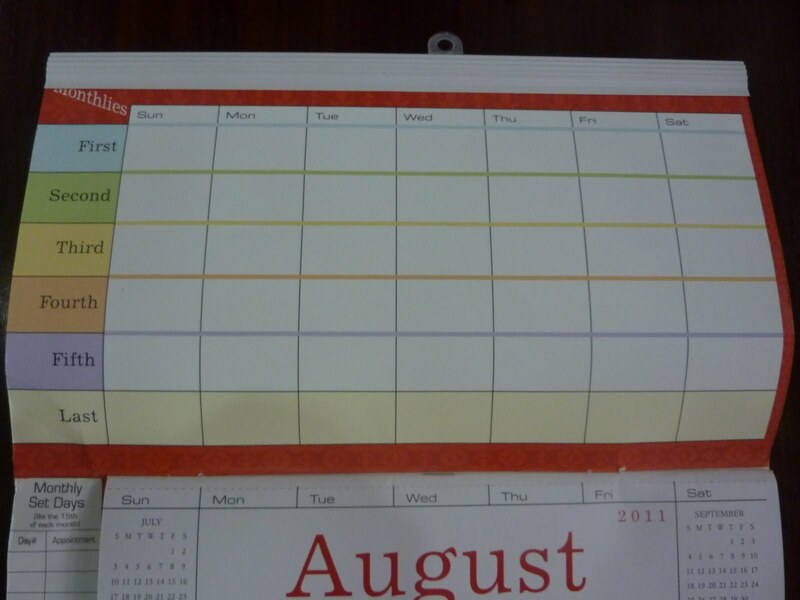 This makes it so easy to accomplish household routines and keep up on chores. Also I marked out "sort mail" because I only get mail twice per month, and added "laundry" because I have a tiny washing machine and if I don't do at least two loads each day I fall woefully behind! 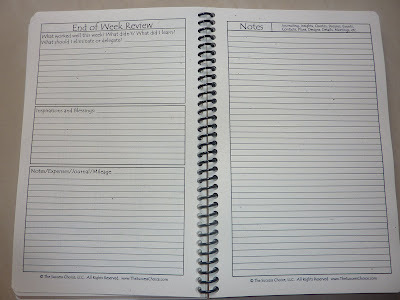 When you turn the page after the weekly schedule, you come to the End Of Week Review which gets you to reflect and record what went well or not so well, gratitude/ inspirations, and any other notes. I use the space at the bottom left to record Financial things like weekly totals for checking, savings and credit cards, major expenses that week etc. I had never done an end of week review before, but after having done it once I'm hooked. This is an extremely important exercise to keep you on track! 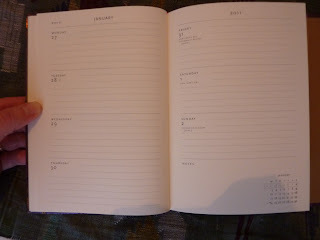 On the Notes page at the right I journal, and this is where I do my monthly review at the end of the month. I love that holidays, moon phases and notable days like Tax Day are printed in the monthly calendars. That gives you two entire years of planning in each quarterly book. Inside the front and back covers are tips and instructions on how to use your planner. I have to admit I was a little overwhelmed the first couple of days I used it, because there is just so much to this planner. But it even says not to feel like you have to do everything all at once, but do things as you are ready for them. 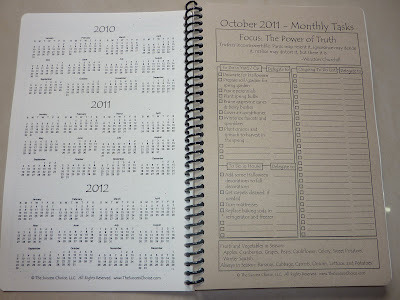 A big difference between this planner and any other I've used is this one holds you accountable. Not only does it help you set goals, but it checks back to make sure you are actually doing things to reach those goals. The weekly evaluation is especially important to help you reflect on your progress. And this continues throughout the year. 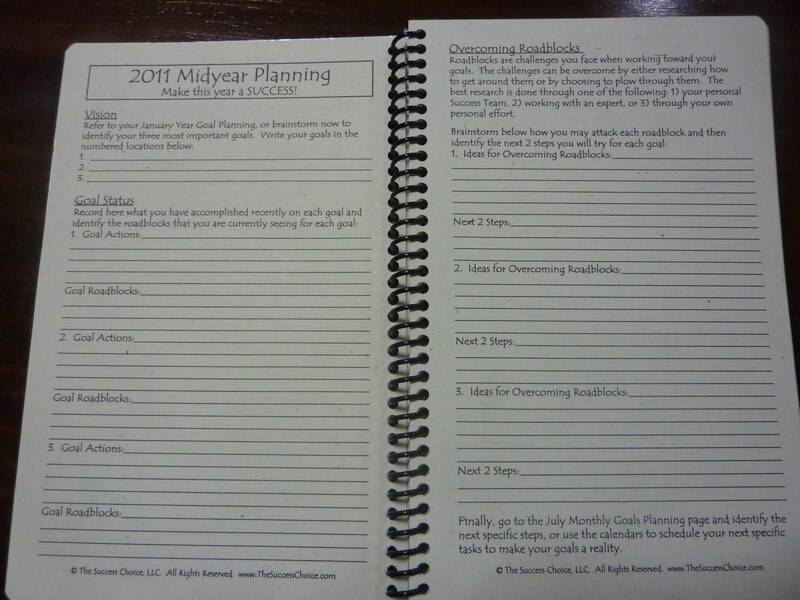 So throughout the entire year you set goals annually, mid-year, monthly and weekly. You then review each week, month, half-year and year. This is absolutely amazing. You can track your progress and evaluate your goals along the way. I ordered the year's worth of planners for my sister, and we received our planners on the same day. When we spoke on the phone that day she said, "I feel like today is the first day of the rest of my life!" I feel the same way. 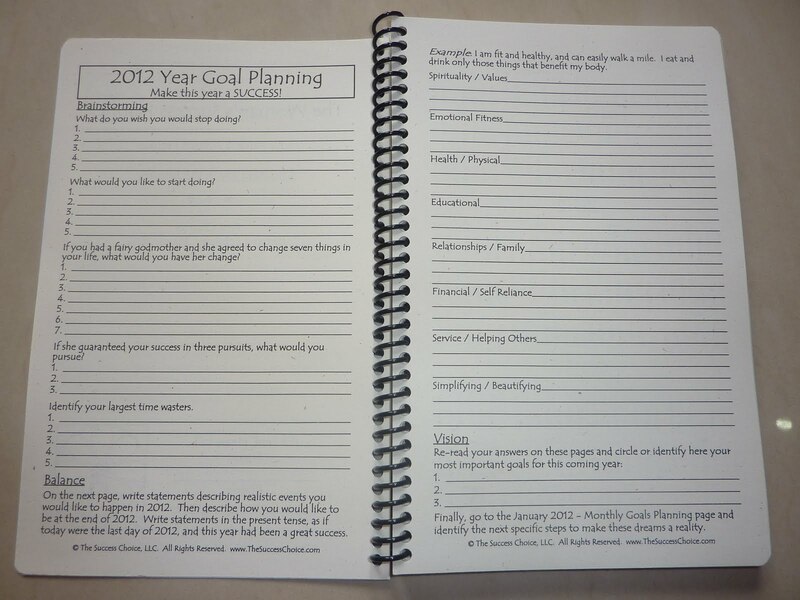 Whatever your goals are, this planner is an excellent tool to get you there. The motivational themes and quotes give you direction; the plethora of pages for notes and journaling mean no idea will escape uncaptured; and the goal setting pages get you to focus on what you really want. And like I said before, the regular reviews of your accomplishments allow you to know exactly where you are on the path toward your goals. 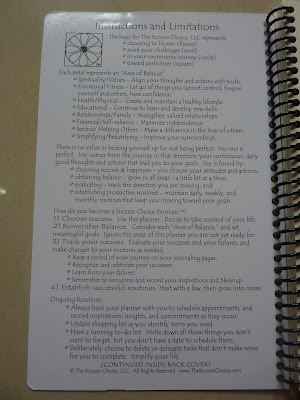 My brilliant sister also pointed out that this planner is like "a syllabus for our lives." You know how in college you had a syllabus for each class where you knew exactly what assignments were due and what material would be covered on each date? This planner is like that, for your actual life. Each time you turn the page, there is what you need right now. 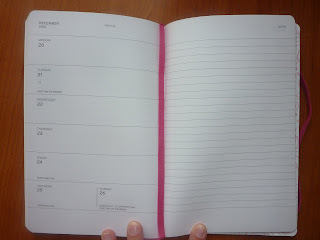 In a couple of days I will review the Address Book, which you might have guessed is way more than just an address book! I have also ordered the gorgeous yellow leather cover which I can hardly wait to get, but will have to wait until my in-laws bring it when they come to visit at the end of this month because I can only get documents and books through the mail. I got one for my sister and she says it's "like buttah" and so soft, I can hardly wait to get my hands on it! Even if you decide not to use this as your main planner, it's an invaluable tool for goal setting, evaluation, journaling, household routines, healthy living and motivation. 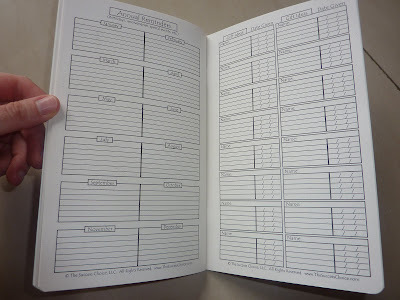 This planner would be wonderfully useful for any woman at any stage of life. 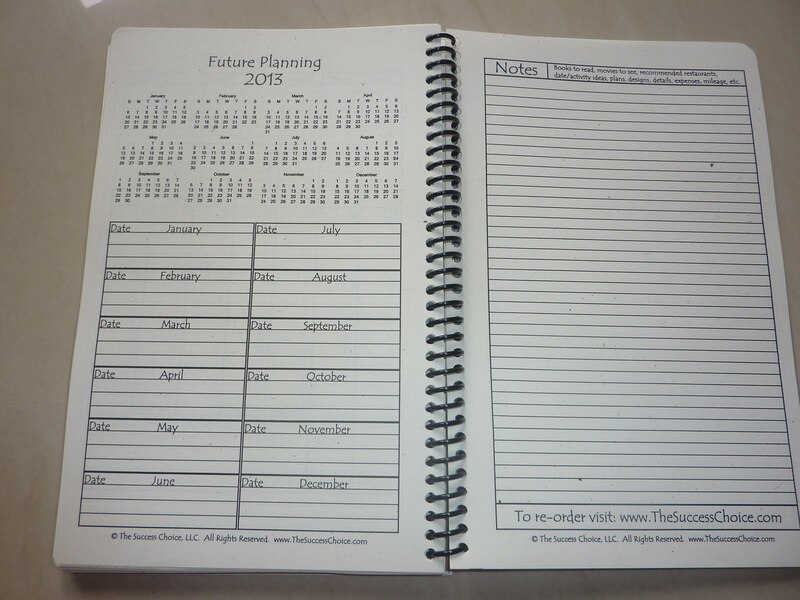 Each planner is 8 1/2 x 6 inches which makes it extremely portable. I hardly notice it in my bag, which is great because I take this planner everywhere with me to capture ideas and plans. Please note these are slightly wider than a large Moleskine and do not fit into Moleskine covers (I tried all of mine and the book is wider). If you'd like a cover you should definitely check out their gorgeous hand-made (in the USA) leather covers here. If you decide not to get a cover that's fine too, the laminated heavy card stock will certainly survive whatever abuse you dish out. I have to say I really like the seasonal colors of each quarter: ice blue for Jan-Feb-March, green for April-May-June, yellow for July-Aug-Sept and an autumnal red for Oct-Nov-Dec.
You can buy just one quarter, half year, or entire year at the Success Planners website. 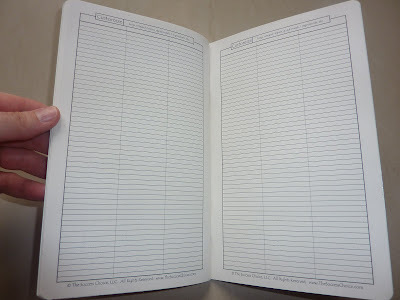 There are also loose-leaf pages if you want to use a ring-binder system. ***Edited to add: The Success Choice now does overseas shipping! Click here to contact the company for more information. Also, you can follow Pamela on Twitter. 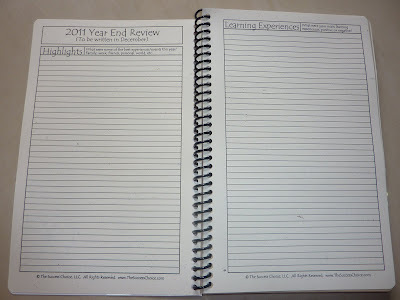 I know this post was extremely long but I haven't even covered all the possibilities for this planner. 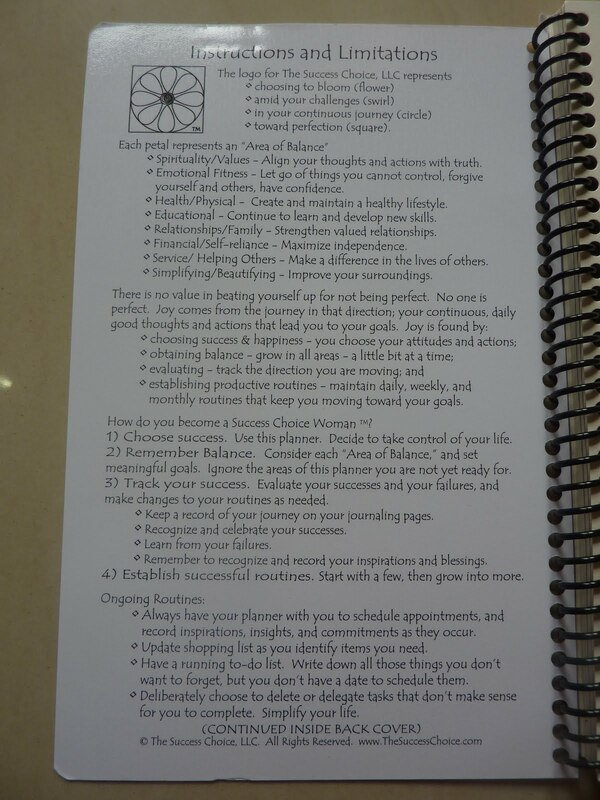 The Success Choice website has lots of information on how to use this planner to enrich your life. 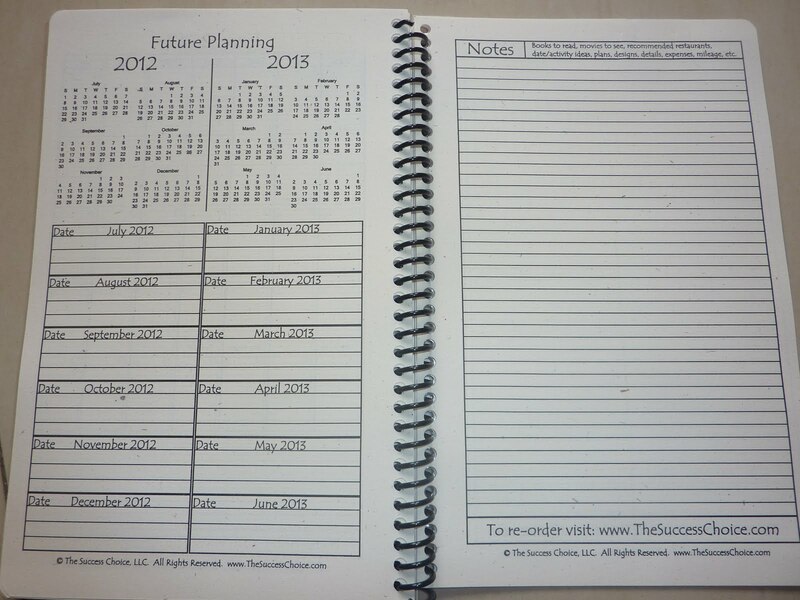 Please check out their website for more information about these amazing planners! I tend to overschedule and overtask myself on Mondays. At the beginning of each week I have a huge list of to-dos, and I normally underestimate how long each thing will take. I try to tackle these things straight out of the gate on Monday. I end up finishing about 1/3 of my list, which makes me feel frustrated and I wonder where my time went all day. Another aspect of this problem is procrastination. Those tasks that didn't get completed last week have now moved up the urgency ladder and I have even more pressure to complete them today. Do you tend to overtask yourself on Mondays? 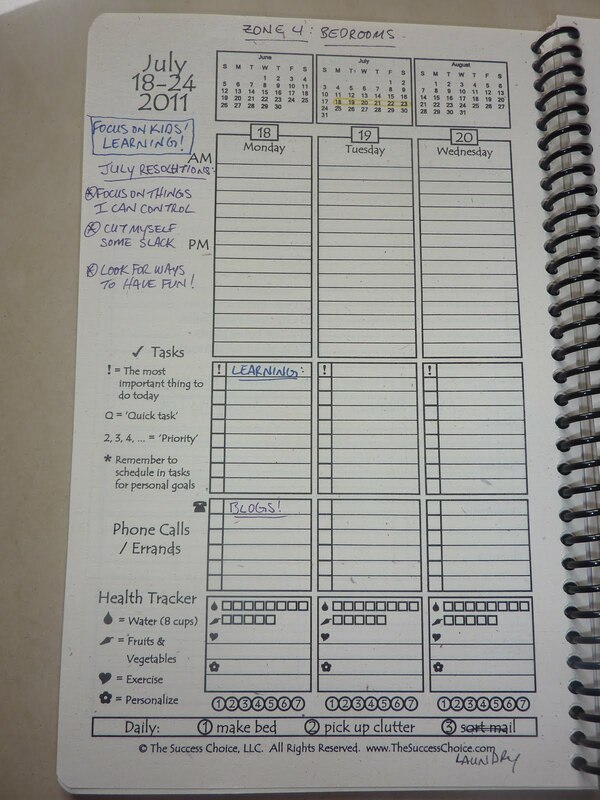 1) Write weekly goals on your weekly page. Find someplace on your weekly spread to write your goals for the week. Be brief, but specific. "Run 3 times this week" is a goal. "Finish reading" the book you're on is another one. "Complete the paper" that's due next week is an excellent goal. Keeping your weekly goals in front of you all week makes it more likely you'll follow through with them. 2) Schedule tasks to reach your goals. Once you know your goals for the week, you can figure out where to fit them into your schedule. When are you going to do those three runs? Write it in. Schedule time to complete that paper. Find a couple of evenings in your week to settle in and read that book. Having goals is great, but they won't get done unless you take the next step and actually make the time to do them. And being able to check off those goals at the end of the week is a great feeling. 3) Keep a task list. 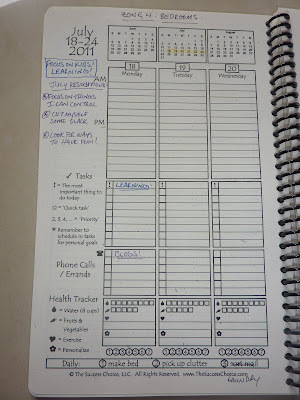 This can be on your planner page if you use a week + notes format planner, or in a separate notebook. You can create categorized lists like @Phone or @Computer to streamline your communication time; or you can write lists in chronological order like 1) Look up website to check availability of hotel, 2) Write down hotel phone number, 3) Call hotel to book, 4) Print out hotel reservation sheet (or whatever your multi-step task list consists of). 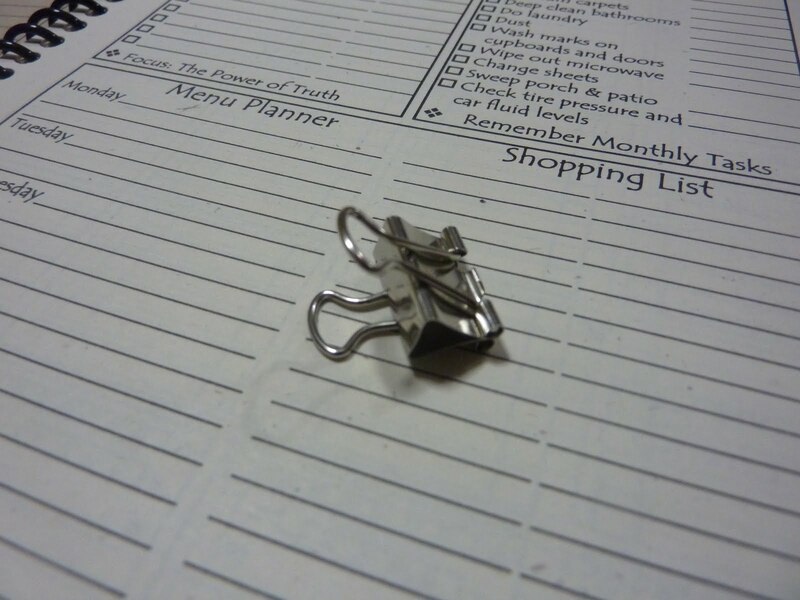 Remember, you'll be working from your main list on non-scheduled tasks. 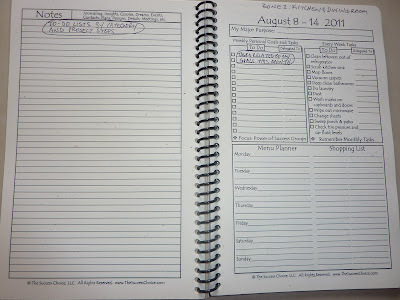 4) Write all appointments into your planner, EVEN (ESPECIALLY) UNCERTAIN ONES. Use pencil on uncertain appointments if you want. But make sure you capture every scheduled item on your daily spaces to avoid scheduling conflicts, to know when you have time available, and to be able to see when you will get things done. 5) Arrow over undone tasks. This is especially easy if you use a format with days as vertical columns. Anything that doesn't get done today gets arrowed over to tomorrow, to avoid re-writing. It's also a great visual cue: the more arrows you have either means you are over-scheduling yourself, or you are procrastinating too much! 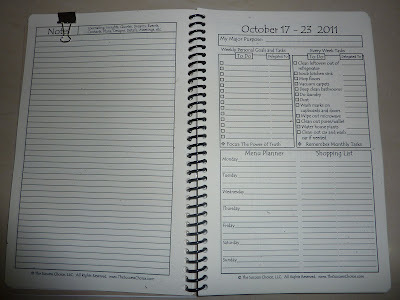 6) Keep your planner open in a prominent place. Whether it's on your desk, kitchen counter, or wherever you spend most of your time, be sure your planner is open to the current week in a place where you can consult it often throughout the day. 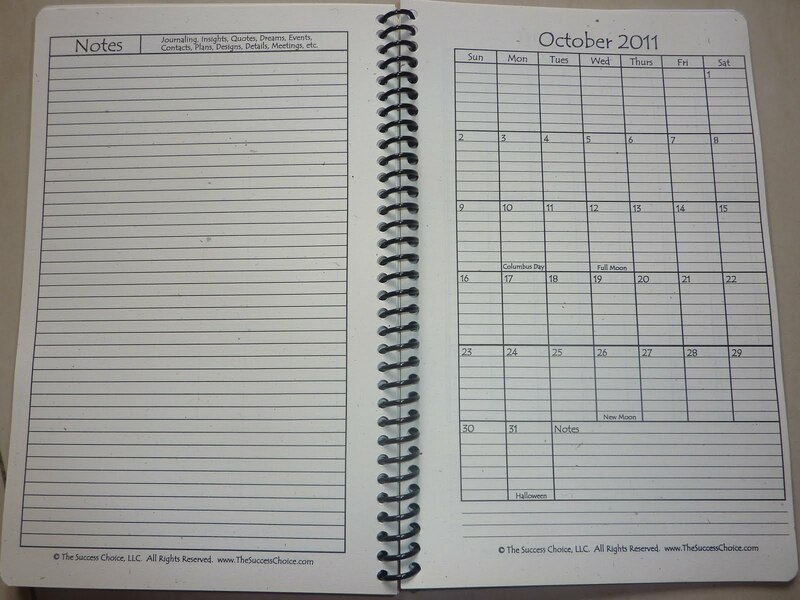 The key to using any planner is to look at it often throughout the day. 7) Highlight important events, deadlines, due dates etc. You can write these things at the top of your day's space in a prominent place, write them in red ink, circle them, or use a colored highlighter. Whatever your preferred method, make sure important events are as visible as possible so they don't get lost in all the other writing on your pages. 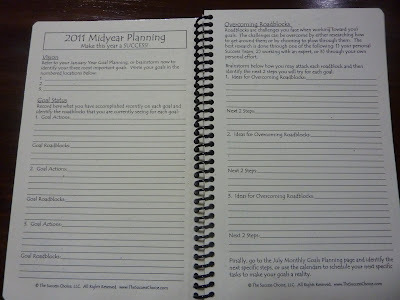 What are some of your planner usage tips? 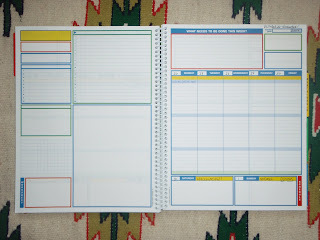 In this post I will focus on formats of weekly planners, since weeklies are the most popular planner style. 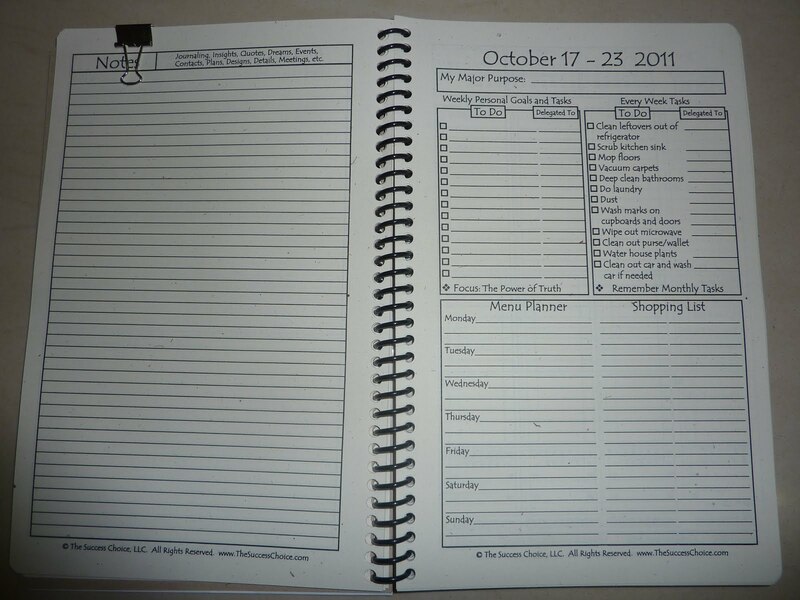 There are lots of different formats of weekly planners. 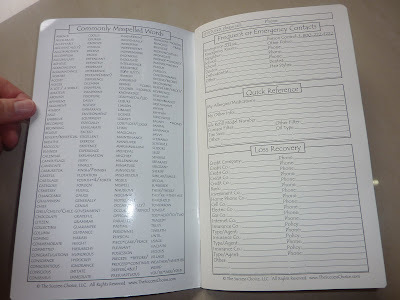 In this post I will give examples of the most popular weekly planner types, and I'll discuss uses for each. 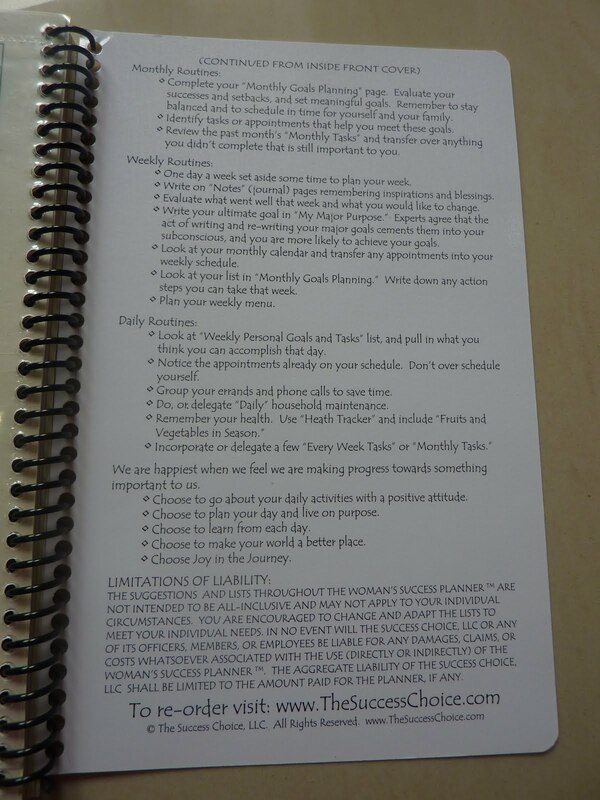 Below is the Success Planner's vertical weekly format (click photo to enlarge image). I'll review the Success Planners next week. Be sure to see Rori's excellent review of it here. 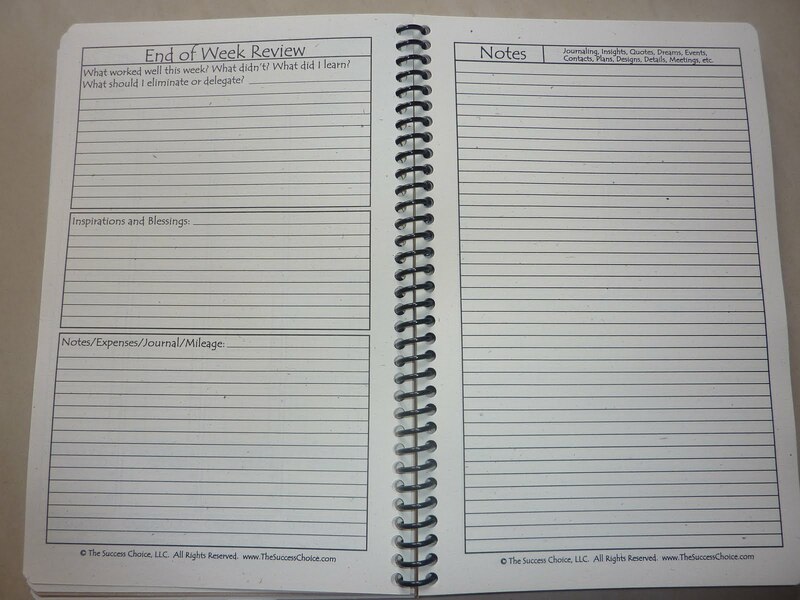 The Week + Notes format is great because it allows lists and notes to be written alongside the weekly schedule. This lets you see what you need to do (on your lists) and when you have time to do it (in your schedule). 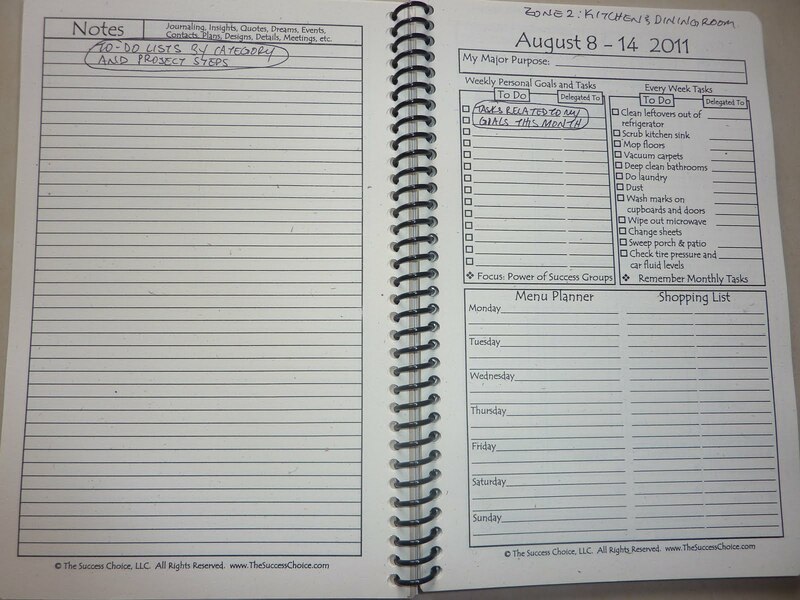 Week + notes planners can combine notes and lists with either a horizontal or vertical daily format. 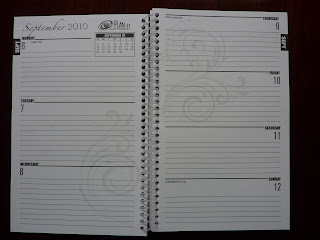 These are only the most popular formats of weekly planners. There are other formats available but they may be harder to find. 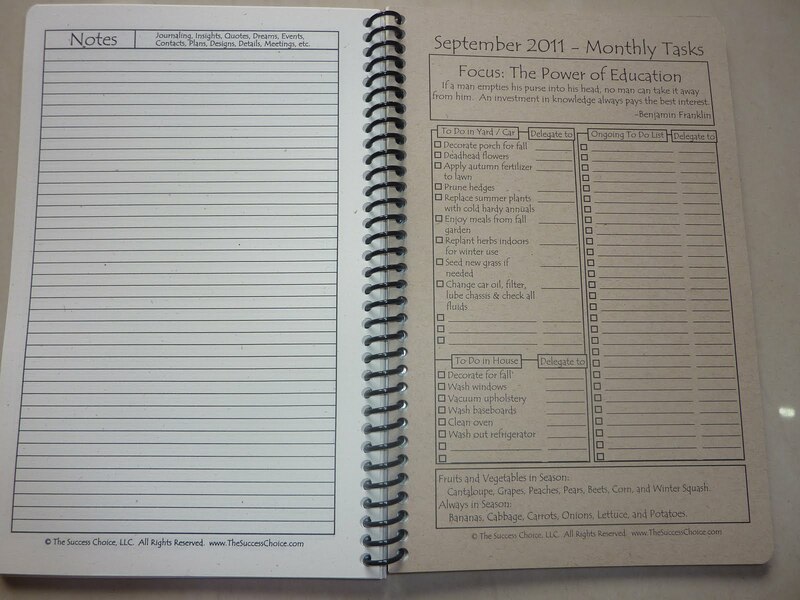 One example of an alternative weekly format is the Redstar Ink planner, click to see the page layout in their academic year and undated planner. 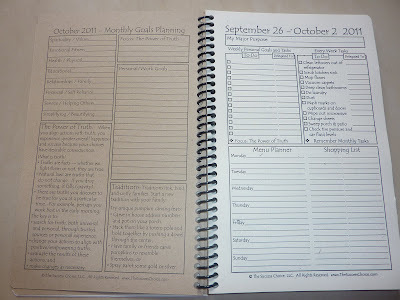 Do you use a weekly planner? Which format do you prefer?